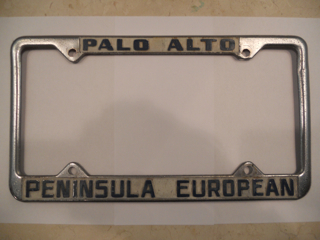 It was a while ago that I picked up a license plate frame from a fellow Pelican from "Peninsula European" in Palo Alto Calif. I bought it because I used to live in Palo Alto and Los Altos back in the '70s. A long time before it was Silicon Valley. I remember seeing Peninsula European as I was tooling around the area. I have been trying to dig up some info on it but have come up empty handed online. Does anyone have a recollection of this shop and where it was located?